Hello, my fellow Nail addicts! 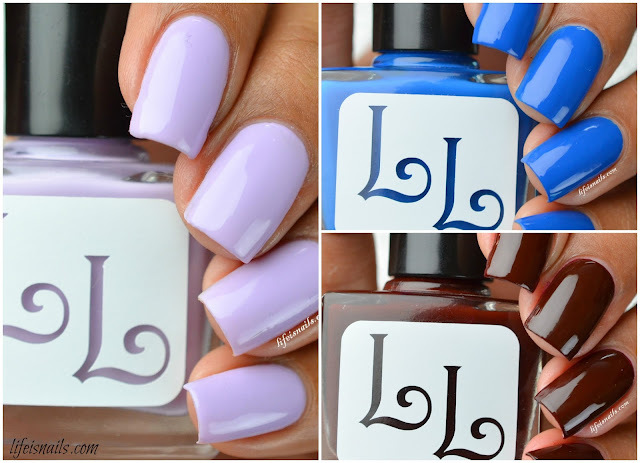 Today I have a quick post to show you the swatches of a very new to me brand polishes known as Lucky Lacquer. She sent me these 3 distinct shades to try and I have, to be honest, I am not a huge fan of these type of shades but the formula made me fall in love with this brand. She obviously has more stunning shades which you can get from her shop. So let's not waste any more time and jump onto the swatches. Mild Cienna - A beautiful Light lilac creme, opaque in 2 coats. This color looks like it will be sheer but it's not! Formula wise super smooth. Shown here is 2 thin coats plus topcoat. June Sapphire - A light cobalt blue again opaque in just 2 coats, formula wise it was smooth and easy to apply. Shown here is 2 coats plus topcoat. Shown here is 2 coats plus topcoat No staining at all. Overall I loved this brand due to its formula and variety of colors it has! For all those people who asks which polishes are best for water marbling, here is your answer right here!! You can get these polishes as well as her new collections on her Etsy shop. I am really sorry for being MIA for so long. I was admitted to hospital for typhoid and I just got back home a couple of days ago and I am still recovering. Today I have another stamping plates review and this one is from Born Pretty Store. I will also be reviewing Born Pretty Store Squishy stamper (which comes separately and not along with the plates). Born Pretty Store is your one-stop destination for all your nail art needs. They also carry stuff for makeup, clothing, jewellery needs and much more. You get all the stuff in a pretty affordable price range. They also provide FREE WORLDWIDE SHIPPING. I will be showing you 1 nail art using each of their plates, their squishy stamper, but before I show you them, let me tell you a bit about the products shown above. Stamping Plates - The plates comes in a rectangular one side opened envelope cover whose material is thick so it's good to store your plates if you don't have a case for them. Each plate comes with a blue film for its protection from any scratch which you need to remove before using the plate(which I removed earlier). Each plate measures 12.5 * 6.5cm. Both the plates image were properly etched for easy and clean pickup. Squishy Stamper - This stamper comes in 2 different colors, one is Translucent and other is red. I chose red because I heard good things about it. It comes with a plastic scraper. The stamper picks up good, but it misses some spots here and there(which can be because mine came with a tiny dent, on which they agreed to send a replacement head ) which is totally avoidable with the given price range. The holder of the stamper is plain steel which I covered with black glitter for better hold. It didn't need any priming, I just washed it once with warm water and soap. Teal Green Stamping Polish - The stamping polish comes in a 15ml bottle. It's very pigmented and transfers onto the nail really well. The only drawback I found was that it has a very strong smell, so you better use it in a well-ventilated room, otherwise it's a complete win-win. Okay so now let's look at the nail art looks I created using the products. BPL-024 (Floral themed images) - For this look, I first created a gradient using Dance Legend 540, El Corazon 423/263 Cream and Absolute New York Pure White over a white base. Then I stamped the diagonal floral image from the BPL-024 Plate using NailMatinee White stamping polish and Red Squishy Stamper from Born Pretty Store. Then finally topped it with the glossy HK Girl Topcoat. The Pickup is really good.Right!? BPS-008 (Arabesque themed images) - For this look , I started with Dance Legend 538 as my base, Made a decal of this beautiful garnish/border image from BPL-008 using the stamper and the teal stamping polish , and applied a thin layer of top coat over the image on the stamper, once dry peeled it off from the stamper and placed it onto my base polish near the cuticle and sealed it off with a glossy top coat. It picked up real nice again! Overall I loved the plates etching and designs in them, The squishy stamper and the polish. The best thing about them is that they are super affordable and perfect for beginners as well as others. It's super cold out here today and I am sitting here with a cup of hot coffee getting super excited to share with you the swatches and review of the Bundle Monster Fundamentals Gel Polish Collection today. To those of you who's wondering what's so special about this post, let me tell you these are the first gel polishes I have ever used. Special right!? This set comes with 1 UV/LED flashlight, 3 essential colors which are Red, Black, and White. For the flashlight, you will need 3 mini batteries to make it work unless you are an idiot like me who thought it doesn't need any batteries and start pushing the button to turn it on! I always thought gel polishes must be really difficult to apply and curing and wiping and every other term that professionals used made me go crazy because I never understood a single word what all those things meant and how difficult the process was. So when I saw this Fundamentals collection with a cute little LED Flashlight, I had to experiment with them and explore new levels as an artist. With this set in hand, there is no need for that bulky led curing lights or those Base and Topcoats and especially that wiping the tacky layer that everyone used to talk about. NO NEED!! All you need to do is Take off your polish, clean your nails completely, push your cuticles back and apply the polish like you usually do, clean the cuticles and skin around the nails using acetone and a brush, once it's all cleaned, Cure the nails with the LED flashlight for about 30-60 seconds. What's the benefit with gels? Let me tell you gels are the best because you can go on and on with the application until you are satisfied with the coverage because until you cure the gel with the Led light, it doesn't get dry. YAYY for GELS!! Well off course this info was only for the beginners like me who are just getting into gels for the first time. For all my swatches I used a peel off base coat under the gel colors because I had to remove them right after I click pictures for swatching purpose, so you don't need to use it. :) I did 2 coats for each polish, Let's get into the swatches shall we!? Rouge Lipstick - Its a gorgeous tangy red creme, almost a one coater. The formula looks thick and gloopy but when you apply the color on your nails, it's super smooth to work with. Trust me, guys, I was so scared that it might flood my cuticles but NO! not a single nail cuticle was messed. LOVE GELS!! Cocktail Dress - A lovely black creme, it was way too sheer for its first coat, which was a bit disappointing for me but it covered well in the second coat. But I truly think black should have been one coater anyways its application was smooth and easy to work with. Overall I loved this must have Gel kit from Bundle Monster, The application was super smooth and the formula was great to work with, covers the basic/ necessary colors and the best part it comes with a handy Flashlight which you can put in your bag and travel day long. SO FUN!! This Bundle Monster Fundamentals Gel Polish Collection is available at their website.